We rode to the Fiets of Parenthood Family Bike Games in lower Wallingford this afternoon. I wanted to bring Brandt’s Kinderbike balance bike for the kiddie stuff so we lugged that behind us in the Burley while the boys rode in their little Bobike bike seats. The festival was awesome. 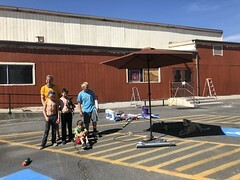 It was incredibly hot out, but there was plenty of shade as well as a misting station, in which the boys both got completely soaked. But our first stop was the helmet fitting station. Mini still isn’t a fan of the helmet so hopefully now that it’s perfectly adjusted he’ll stop clawing at it. Brandt’s adjusting didn’t go so well as the helmet gal buckled his chin into the clasp, giving him a couple red welts. Thank goodness for the gelato bike (a Madsen filled with tubs of ice cream). Brandt valiantly tried to eat his two ice cream cups before they turned to soup, but he ended up pretty sticky before he gave up and poured the remains out and stomped in the puddle. After decorating his bike with pipe cleaners, sparkly stars, and beads, Brandt hit the obstacle course featuring a teeter-totter, ramp, and cone slalom. I thought I’d have to lure him away with more ice cream, but he eventually took a break so we could get back in the shade. We all participated in the adult/kid race, but I think we got the slowest time of the whole field. We lost the race before we even entered the course since at “go” the first step was to get the kids on the bike and then enter the course. Mini usually comes when I call him, but I still wear him in the sling for putting him on the bike just to keep things easy. We did fine at the stop sign, pick up the dropped toy station, joust, grocery bag pickup, ramp, and “rain storms” (kids squirting us with water guns), but at the last station (berry picking), I tipped over. I think we didn’t even reach a 45 degree angle before people ran over and helped right us, but it was pretty embarrassing. Dan got back from his week away and met us at the festival, fortunately after my lackluster performance. A couple people came by and told me their own and other’s fallen bike stories, which made me feel better, but clued Dan in on my earlier mishap. The usual suspects were all there: Madsens, Xtracycles, Bakfiets, Bullitt, tandems, trail-a-bikes, and trailgator. One new thing we saw was a very cool kiddie pre-bike ridden by Baby Totcycle: the balance-trike-into-balance-bike Wishbone Bike. I didn’t get a chance to put Baby Rijder on it because his friend Baby Zevin wouldn’t give it up. I think his parents have probably already ordered him one. On the way home, we hit the after party barbeque for salmon burgers, beer, and chilling while the day cooled down. Brandt was a bit too small for the super-cool custom play structure, but he made do collecting garden rocks and shuttling them around in a toy truck. Baby Rijder kept trying to use a dump truck as a walker, but pushed from the wrong side and caused the bed to rise up and bop him on the forehead. It happened three times so he’ll probably have a nice bruise tomorrow. I saw a bruise in the same spot on Baby Totcycle which I’d guess was earned the same way. Baby Rijder had a pretty good day in the double trailer to Magnuson Park and back today. He still hates his helmet, but Brandt was able to keep him from noticing it for quite a while by feeding him bites of rijstwafel (rice cracker). On the way back I saw a baby in a Burley nestled in a little taco shell. I just looked it up and it must have been the Burley Baby Snuggler, but it’s only for jogging with so there goes my almost solution for Baby Rijder. The ride itself wasn’t bad. It was freezing at the park and a bit windy heading back. I’m just loving riding the road bike and actually passing people on the trail. Everyone passes me when I’m on the Bianchi. Stone is still hard and my timing today made it extra hard as I had to sit up and wave at four Ride the Ducks boat cars on the way up. Maybe Brandt wouldn’t notice if I didn’t wave when he’s tucked away back in the trailer, but at this point it’s second nature.